Chou Chou! 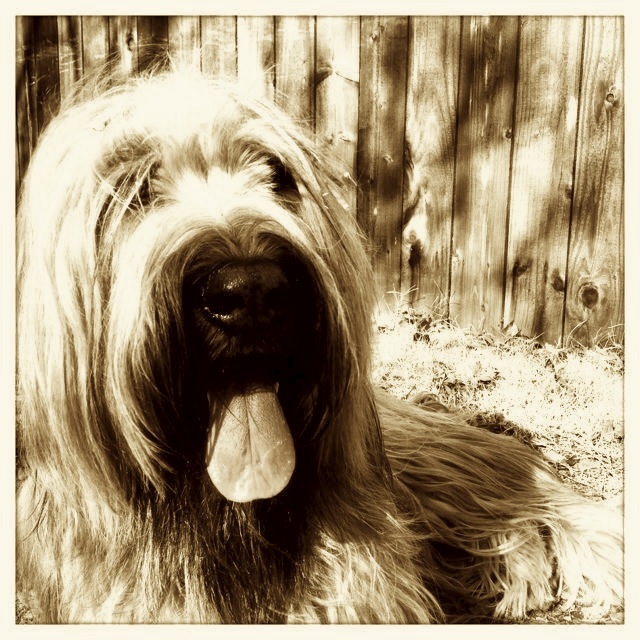 Adventures of a Briard Girl : Is Chou Chou Briard A Spy? Is Chou Chou Briard A Spy? There are many meanings to the pronunciation of Chou Chou's name. I named her Chou Chou, French for cutie pie, because briards are French herding dogs. But the sounds "shoo shoo" in Hebrew can mean spy. Is Chou Chou a spy dog? I didn't consider this until someone saw her Halloween costume and suggested that it might actually be a disguise. Most dogs do not wear big sunglasses that hide their faces. 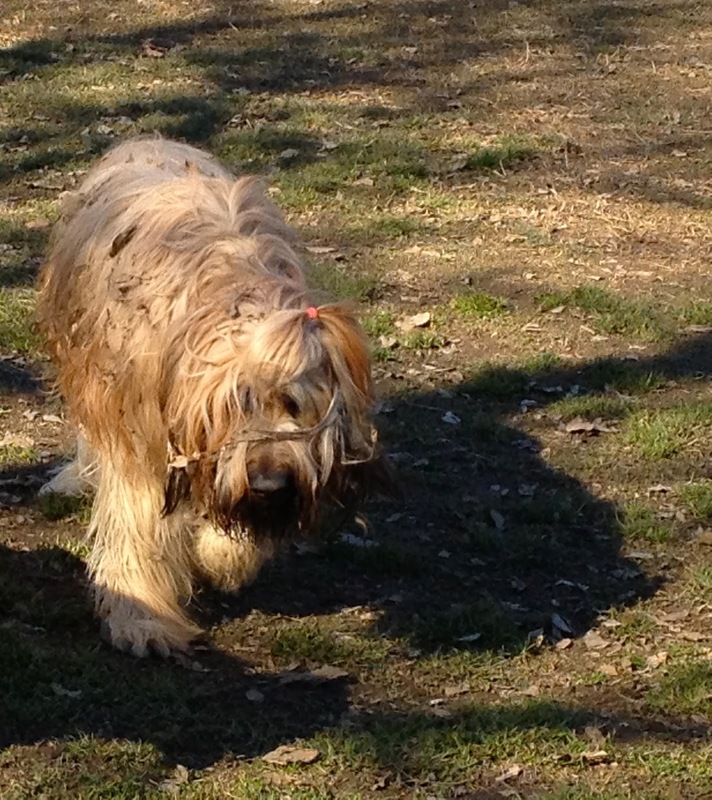 But there is Chou Chou Briard, behind big shades. Other instances of Chou Chou disguising her face include hiding behind this Frisbee. What do we know about Chou? We know her parents were from the Czech Republic. But she was born in Canada and flew to the US, first to San Francisco and then over to Sacramento. Lots of international intrigue there! From an early age, she walked around our home in a beret. Later, she wore her beret in public. And at dog parks, she showed a preference for French poodles and a bichon frisé. She's never been to France... although I can't be sure of that. Who is she working for? She took training classes. She started with a basic group puppy class, but was asked to leave and never come back, because she was being disruptive. Next, she took an advanced obedience class, and then the intermediate level class -- yes, in that order. Very strange! But stranger still, she took a tricks class, where she learned to crawl through a tunnel and jump through a hoop. Allegedly, she learned to read 3 words, on papers shown to her, and then follow the written commands... but it was a deception. What was she planning to do with those skills? I never understood why she practiced camouflaging herself. But that would come in handy for spying, wouldn't it? As she got older, she started collecting disguises. I thought they were harmless costumes. But, as friends and briard owners pointed out to me, most dogs won't tolerate being dressed up. There was something odd about Chou Chou's behavior. From the beret and graduation cap, she moved on to ever more extreme -- and more expensive -- custom made hats. There is much a spy dog can hide in a hat like that! And then came the "Halloween costumes." One year, she wore a simple butterfly costume. But wait! What are those antennae? She may be receiving or transmitting messages for a foreign country! This year, she had a sheep costume made just for her. And I've seen her acting sneaky. She often jumps up on public counters (but never at home), and there is some sort of exchange; for example, when she goes to the vet. Or once, I took her to the dry cleaners, and she jumped up on the counter. Something was passed to her. It was disguised as a simple treat, but who knows? I didn't think to examine it more closely. I trusted her. So, is Chou Chou a French cutie pie, or is she really a spy? I vote for Cutie Pie !! !